Thomas Howard, Ajar, pencil on sketchbook paper, 3" x 3"
I am 17 and was born on Long Island. I'm an emerging artist and began training independently at 10 years old. Now, I take pride in having developed a unique approach to realism without any assistance over the course of my life. 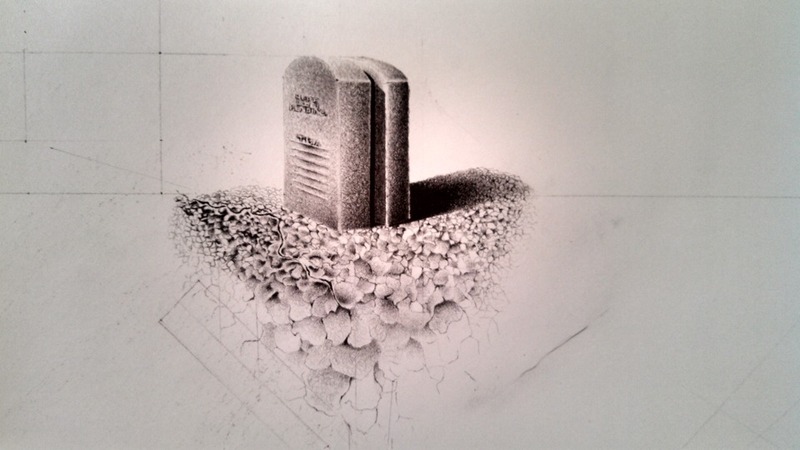 My work primarily consists of finely-detailed, small-scale pencil drawings, which capture gothic and graphic themes executed with technical knowledge of anatomy and architecture. From a young age, I had already realized my specific style. It serves me now as I pursue hyper realism, a long-term objective of mine. As I progressed it became more apparent how unusual reaching a formidable level without schooling (or any type of formal instruction) was, so I resolved to embrace this as a signature element. It wasn’t long before I began refusing sophisticated tools and media, exclusively used a standard #2 writing pencil for all my renderings, and relied entirely on memory rather than photographs or models. Simultaneously, my expression began to cater to certain aspects of my life more than others, as the imagery at times became grotesque, jarring and bizarre. These decisions have allowed me to establish a very intimate setting in my work. My most recent solo exhibition was held at 4 North Main Gallery of Southampton, and previous to that I partook in a group showing of Princeton. I believe the message expressed by the artist’s work assigned to me was relatively clear. It was interesting to channel the theme into a setting I could relate to personally, and I tried to reserve the clarity of the statement as best as I could, while incorporating my style.